Hey friends! We were having this discussion internally, so I wanted to throw it out here to get more feedback. Part of our work while we are getting to 1.0 is to finally fix quality of life changes we have been meaning to make for a while to reflect a polished 1.0 product. What qualifies as a Quality of Life improvement? See the criteria below: A change that addresses a mismatch between design intention and player expectation. A change that uses or changes only existing systems Has low disruption to other features and systems in the game Examples of ones currently on the list: 1. Changing worklights and generators so you can see the power plugs that pop out on their deployable platforms before placing them 2. A "use" action for medium storage to make them go flat or stand up 3. Oxygen tanks in aux slots should be rotated 90 degrees so you can see how full they are QoL improvements are not new features, new systems, overhauls to design, or critical bug fixes. So if there are some small things that have been bothering you, or don't match up with what you think a thing should do, or something that could be WAY better with just a small tweak, drop it in here! Thanks! LOOKING FOR 0.10.5.0 PATCH NOTES? CLICK HERE Steam 'Early Access' players will receive this update September 6th, 2018. Xbox 'Play Anywhere' players can also expect this patch to hit their consoles or Windows 10 machines throughout the day September 6th, 2018.﻿ Update 0.10.1 contains a complete overhaul to the crafting and progression systems, including new resources, minerals, recipes, modules, and a new shuttle! New Crafting Progression Astroneer now has multiple stages of crafting progression! In order to prepare for new items that will be added in 1.0 as well as creating a progression that encourages exploration, we have overhauled the progression of crafting. There are now new resources in the world to gather, completely new craftable resources, and a new resource type, Atmospheric! Now, in order to craft everything in the game, Astroneers must travel to different planets. Progression now happens in a few stages: Stage 1: Gathering resources with your terrain tool. In addition to the existing in-game resources, there are several new mineral deposits found throughout the world, and different densities of those resources on different planets. Stage 2: Smelting and Refining resources. Like the current version of Astroneer, step two requires smelting and refining materials. There are new smeltable resources, be sure to check their UI card for more details! Smelter has been renamed “Smelting Furnace” More resources can be smelted Stage 3: Extracting resources from soil. This system has gotten a complete overhaul. 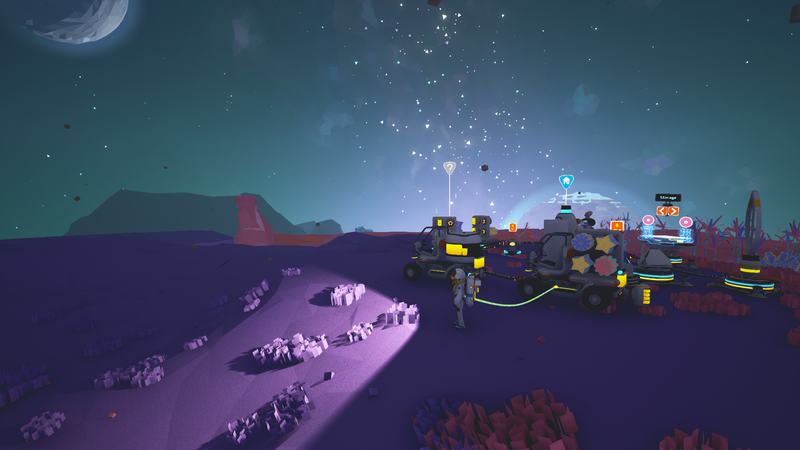 Rather than just extracting all resources, the newly dubbed "Soil Centrifuge's" role is now to help Astroneers extract common resources without all of the manual labor. This should allow players to focus on finding rare resources and automate the process of gathering items like compound and resin. Mineral Extractor has been refactored into the “Soil Centrifuge” Centrifuge provides easy access to common and uncommon resources but no longer can create all resources. Stage 4: Compositing two resources together. Stage 4 now requires some science! In order to create rare composite resources, Astroneers must use the "Chemisty Lab" to combine resources from the above steps. Rare resources will now sometimes require a specific atmospheric gas to create. Hydrazine Catalyzer has been refactored into a “Chemistry Lab” Brand new resources can be crafted by combining multiple resources together Some high-level resources require an Atmospheric resource as a type of fuel Stage 5: Collecting Atmospheric Resources. As mentioned above, Atmospheric Resources are a new resource, and the new Atmospheric Condenser is the way to gather them. Not all atmospheres have every gas, and some have higher concentrations of gases than others, so make sure to visit new planets in order to collect all gases for crafting! Fuel Condenser has been refactored into the “Atmospheric Condenser” Visuals for the module have been completely replaced Allows you to collect different resources from the planet’s local atmosphere Different planets have different resource availabilities! New Resources and Recipes A new ore has been added - Sphalerite. Sphalerite can be smelted into Zinc, and is found above ground and below ground on most planets. New types of resource deposits have been added - Quartz, Clay, and Graphite. Quartz can be smelted into Glass Clay can be smelted into Ceramic Organic can now be smelted into Carbon. Coal deposits have been removed from the game and any existing Coal nuggets have been migrated to Carbon nuggets. The Medium Generator now uses Carbon! The following new crafted resources can be created at the Chemistry Lab: Rubber Plastic Aluminum Alloy Tungsten Carbide Graphene Diamond Hydrazine Silicone Explosive Powder Steel Titanium Alloy Nanocarbon Alloy The following new atmospheric resources can be gathered using the Atmospheric Condenser: Hydrogen Argon Methane Nitrogen Helium Sulfur To enable early game exploration of new planets, two new items have been added: the Solid-Fuel Thruster and the Small Shuttle. The Solid-Fuel Thruster is unlocked in the Catalog for 500 Bytes and is printed from the Small Printer for 1 Aluminum and 1 Ammonium. This disposable thruster will enable you to take a one-way trip to another planet so you can collect the resources you need to complete your crafting progression. For your convenience, it prints to a small package that fits in your backpack, so be sure to take spares with you if you want to make round trips! The Small Shuttle is unlocked in the Catalog for 1500 Bytes and is printed from the Vehicle Bay for 2 Aluminum. The Small Shuttle works with both the Hydrazine Thruster and the Solid-Fuel Thruster. Recipes for many of the objects in game have changed! The goal of these changes is to give each item a clearer place in the crafting and gameplay progression. We hope players will now have a much more gratifying sense of progression as they unlock and craft new technology! Because this is such a big change for the game, we’d love to hear your thoughts and feedback on the forums. General Changes The Catalog has received a visual redesign! We heard your feedback loud and clear on this, and with all the new recipes, we decided to overhaul the catalog and the information provided within. We hope that players will now make better informed decisions when spending bytes and planning out progression! It now shows the required print resources to help you decide how to spend your hard-earned bytes To further streamline Research and Printing, researchable items have been arranged by the printer type they come from (Backpack, Small Printer, Medium Printer, Vehicle Bay) instead of their gameplay role. All Fabricators have been renamed to Printers. Collectible power nuggets and oxygen nuggets have been removed from the game! To mitigate oxygen “rescue” moments, oxygen filters are unlocked by default and resin deposits are more common. To mitigate power collection, the collectible nuggets surrounding hazards will collect as organic for small power generators. Miscellaneous Hovering over the required Resource holograms on printers now displays information about obtaining that Resource in their Tooltip. There are tons of new things, so this should help players find the resources they need! EXO Wrecks and fallen Astroneer backpacks now have a chance to grant the newly added resources. See you in the stars fallen friends. Byte values of researchable items have been adjusted Byte costs of purchasable items have been adjusted Bugfixes The following live issues have been fixed as of version 0.10.1.0: [AS-2487] - Fixed a bug where the Smelter sound loop would persist for Client players in Multiplayer games after smelting has finished [AS-2676] - Fixed a bug where the Client player in Multiplayer games was unable to hear the Smelter when it was active [AS-3330] - Fixed a bug where the Client player in Multiplayer games was not able to see the preview holograms while printing Medium and Large Rovers [AS-3341] - Fixed a bug where Vehicle Bay will pop to center of the Shelter once it has been unpacked [AS-3362] - Fixed a minor issue with the Medium Solar hologram which appeared too bright in the Catalog [AS-3363] - Fixed a minor issue with the Terrain Analyzer image clipping through the background of the Catalog [AS-3419] - Control + Click shortcut should once again work on the Landing Zone control panel [AS-3426] - Fixed a bug with the item pads of small objects becoming separated from the object under certain conditions [AS-3461] - Fixed an issue where Fireworks explosion became visually offset with the rocket [AS-3465] - Smelter will no longer drop items to the ground when queuing up resources [AS-3509] - Items will no longer fall out of world when packages are unpacked upside down [AS-3522] - Fixed a bug where the green light on the side of certain module packages did not light up [AS-3523] - Fixed a bug where Printers were not prevented from printing when items were placed in the center of the preview hologram [AS-3541] - Fixed a long term usability issue where Smelter slots did not have priority over platform slots for placing ores for processing. [AS-3571] - FIxed a visual issue where the Medium Storage became unskinned for a brief moment when unpacking [AS-3602] - Fixed a number of localization issues in the Quick Help menu screens [AS-3608] - Fixed a number of objects whose holograms appeared too large in the Catalog and caused readability issues with localized text [AS-3647] - Fixed a bug where the Small Fabricator could finish its current printing process while being stowed in the backpack [AS-3665] - Resources found in the white resource caches now show UI information cards [AS-3669] - Exit key is no longer present in the shuttle UI when in orbit [AS-3739] - Fixed an issue that occured when the player died with the research catalog open which caused previously unlocked items to show as locked and unpurchasable after respawn. KNOWN ISSUES: You should not be able to slot anything in the Chemistry Lab tray. Doing so will brick the Chemistry Lab once you start the process. We will be fixing this in a hotfix. For now, make sure to leave the tray empty when creating items. UPDATE: The above known issue has now been fixed in 0.10.2! The hotfix has been deployed on Steam and will be deployed on Xbox once it goes through cert! Thanks for reading! This is a big change for the game, and we would love your feedback. Use this thread to give us your thoughts! We have been specifically tight lipped about this as it is a 1.0 feature! We have been pretty open about most of our EA development, but this one will definitely be better if we don't list it out ahead of time. HEY EVERYONE! This is all amazing feedback. going over it with the team so we can pick out stuff that is doable for 1.0! Thanks for all the great responses and keep them coming! Whoa! A lot to unpack in this thread. I will begin by saying, patch notes are meant to be as thorough and comprehensive as possible. Every team member goes in and adds their work during an update to keep track of what is being changed and what isn’t. In the case of a big update like this, unfortunately some changes fall through the cracks. That isn’t us saying we want to hide anything from anyone, it is just a miss on a rather large list of changes. Comparing us to Warframe is a bit of a stretch, we are a 17 person team compared to a AAA group with tons of support. I would venture to guess they have an entire team dedicated to comms whereas we have.... me. I totally get your feedback though, and am talking to the team about making sure changes don’t slip through the cracks in the future. As far as the discord vs forum thing, I read both every day, and I agree that the forums are still our main place to disseminate information. Patch notes get dropped here first, they rank on google (where most of our traffic comes from) and we link to here everywhere we post them. That being said, discord is also an awesome place for the team to directly interface with players in real time, and will become more and more integrated into our communications as we grow. As always, I appreciate feedback, especially critical because it helps us get better, so keep it coming. I think Wyvyrias does a great job keeping our various contact points moderated on a daily basis, I would read a lot less feedback if I didn’t have him keeping me afloat.